Discussions of charter schools and other forms of “public school choice” often create more heat than light. Both defenders of “traditional’ public schools and advocates of private school vouchers tend to dismiss the “public” nature of charters and treat them as a mere transition model to abandonment of public education altogether. And the widely varying nature of charters–including their relationship to traditional public schools and the extent to which they are genuinely accountable to the public for results–causes confusion as well. 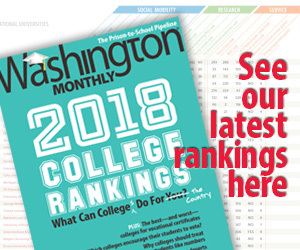 Sam Chaltain looks into how these theories play out in practice at two schools located in Washington’s mixed-income and racially diverse Columbia Heights/Mt. Pleasant neighborhood. One, Mundo Verde Bilingual Public Charter School, is a brand-new elementary school whose founders made the most of their chance to “start a new school from scratch.” Teaching in Spanish and English, the school focuses on environmental sustainability and hands-on expeditionary learning, in which students delve deeply into a topic for weeks at a time, producing original research and presenting the results to the public. The other school, Bancroft Elementary, founded in 1924, is a traditional public school that educated some of the parents and grandparents of current students. But Bancroft also draws almost half of its population through out-of-boundary transfers. And, like Mundo Verde, it divides classes into sections that are alternatingly taught in English and Spanish. So these two schools both abandon the “neighborhood school” concept in favor of a deliberate attempt at socio-economic and linguistic integration. Mundo Verde, which has succeeded far more than Bancroft in attracting a true mix, is unusual in this respect; nationally, most charter public schools mostly enlist poor and disadvantaged students. Chaltain does not suggest that socio-economic integration is easy. He acknowledges that it takes a skilled teacher to educate students who come to schools with differing levels of academic preparation. But a mix of students is far less overwhelming than a classroom of highly needy students, and the burnout level of teachers is much lower than in high-poverty schools. That is what is so exciting about charter schools like Mundo Verde (and magnet schools throughout the country): by virtue of location and an enticing academic program, they have been able to attract a broad cross-section of students. The bilingual program, in particular, vividly illustrates how diversity helps everyone. Spanish-speaking students help English speakers learn Spanish and vice versa. Students from different backgrounds become a resource for one another. But Chaltain notes that choice, by itself, will not promote equity, citing Michael Sandel’s research on “the moral limits of markets.” Integration often slips away, Chaltain says, and Mundo Verde’s founder worried that “there was no way to guarantee that new families would maintain a healthy mix between English and Spanish speakers.” Weighted lotteries to promote integration could help, but in D.C. that was not permitted. Chaltain also notes that the nonunionized teaching staff at Mundo Verde experiences questionable morale, low wages and high transfer rates. This observation made me wonder why charters now usually operate with few if any teacher protections. As Kahlenberg reminds us, teachers union pioneer Albert Shanker was an early proponent of charters, and in the 1990s, charters were on occasion created by teachers unions themselves. But in any event, the rethinking of public school choice as a way of creating not just different methods of instruction and administration, but as a way to assemble different types of students, is interesting and potentially valuable. Some people worry that public school choice can destroy a sense of community as neighborhood children head off to different schools and make different sets of friends. But at their best, if choice programs are designed to support integration, they can create new school communities that transcend the race and class divisions that define so many of our neighborhoods. Chaltain suggests that, in fact, this is a big part of what public schools in America are designed to do—move us beyond segregation to a place where students can celebrate diversity and learn what they have in common as Americans.